Kluyveromyces marxianus is a member of the Saccharomycetales yeast order and is used for a variety of commercial applications, most notably production of ethanol from food waste streams. Traits such as rapid growth rates, lactose utilization, good tolerance to inhibitory molecules and thermotolerance facilitate these applications. K. marxianus is frequently isolated from food and beverage environments and is especially associated with fermented dairy products such as kefir. This history of food association means that K. marxianus has GRAS/QPS status, thereby facilitating applications in the food sector. K. marxianus strains have the capacity to produce a range of volatile fragrance and flavor (F&F) molecules such as higher alcohols and acetate esters and there is consequent interest in exploiting high-producing strains as F&F cell factories. The availability of genome sequences and the development of molecular tools are facilitating further applications in K. marxianus as a novel yeast cell factory for biomolecule production. 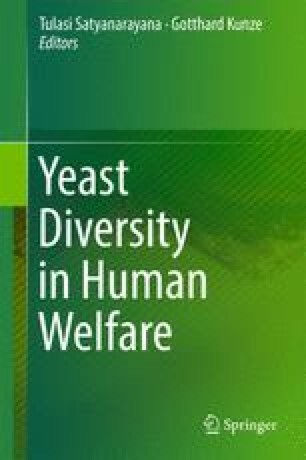 This chapter will provide an update on the genetics and biology of this yeast, and an overview of commercial applications. It will later focus on three specific areas: K. marxianus for bioethanol production; for the production of fragrance and flavors; and the future development of K. marxianus as a yeast cell factory.